June seems to be a "shoulder" season, no matter how much we want it to be summer. I have certain expectations about what conditions we will find in the mountains in each month. For instance, April brings full winter storms, powder skiing, and longer days. Occasionally the skiing and climbing can be spring-like in April. May can go either way. It can be warm and sunny, with corn skiing and dry high-country rock climbs. It can be stormy and windy with short periods of powder skiing between sunny episodes. I have somewhat twisted expectations of what June can be like. I always picture it as summer, and I always seem to be let down. It is still cold, it can still storm, rock climbs up high are still not as dry as one would hope. Especially this year! Man, was it grim up high this year. I mean, I skied powder snow on May 30! So, we changed it up. 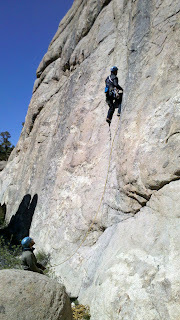 I spent a bunch of time "cragging", sometimes really cold. One notable day at Benton Crags was like mid-winter in the Gorge. Gnarly. It's July, and an end is finally in sight!! !